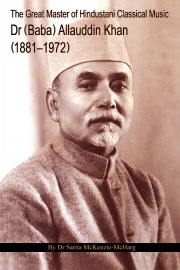 Description of "Dr (Baba) Allauddin Khan (1881–1972)"
The essential research and findings of this book lie in an analysis of currently available documentation—in the form of biographies, books, journals, newspaper articles, essays, manuscripts, letters, interviews and websites—on the life of the late North Indian (Hindustani) classical musician, composer, innovator and teacher, Dr (Baba) Allauddin Khan. – To proclaim and substantiate that his true musical legacy (music as a form of worship) is not afforded appropriate recognition and has been diluted by musicians and scholars alike. Dr Sarita McKenzie-McHarg – BA(Music), MA(Sitar), MMus, PhD (Music) was born at Ujjain, India. She learned Indian folk vocals and dance from early childhood then, as a teenager, began studying sitar and Indian classical and light classical vocals. An All India Radio artist, Sarita has performed as a singer and sitarist both in India and abroad, and enjoys the benefit of vast musical experience with both Western and Indian musicians. She recently published a collection of 75 folk songs titled "Hira Singh Borliya: Traditional Folk Songs of Malwa" – also available at Pothi.com. Reviews of "Dr (Baba) Allauddin Khan (1881–1972)"
This is an amazing story of dedication, perseverance and the triumphant rise of a runaway Indian boy who would eventually inspire thousands of musicians around the world. This book illustrates how Baba Allauddin Khan led the way in a modern renaissance of Indian classical music, displaying profound appreciation for the spiritual value of music and its importance to society. And how, after many years of self sacrifice and struggle, he developed a rich and abiding love and understanding of music that stood him apart from his peers. The book also demonstrates how Baba rekindled the flame of passion for Indian classical music and brought about the greatest surge of interest in Indian music that the world has ever witnessed. It addresses issues regarding his ancestry, his childhood, his travels and travails, and goes on to tell the most complete and objective story of his musical achievements. Finally, it illustrates how he learned from every possible teacher, beginning with his father, brother (and their teachers), sadhus, temple singers, street musicians, and later in life, some of India's finest masters. He never shied away from difficulty nor weakened in his resolve; and as a result of his intense learning, was able to impart an incredible body of knowledge and understanding to his disciples over a period of more than fifty years. Like no other teacher before him, Baba's legacy of musical artists is seemingly inexhaustible—including his own students and those of his students, with such great names as follow. Annapurna Devi (surbahar), Ali Akbar Khan (sarod), Ravi Shankar (sitar), Nikhil Banerjee (sitar), Bismillah Khan (shenai), Jotin Bhattacharya (sarod), Rajeev Taranath (sarod), Joyas Biswas (sitar), Philip Glass (pianist & composer), Yehudi Menuhin (violin), David Murphy (conductor), Ayet Ali Khan (sarod), Timir Baran Bhattacharya (sarod), Rabin Ghosh (violin), Shyam Ganguly (sarod), Vasant Rai (sarod), Khadem Khan, Mir Kashem Khan, Bahadur Khan (sarod), Yar Rasul Khan (tabla), Projesh Banerjee (sarod), Sipra Banerjee (sarod), Suprabhat Pal (sarod), Sharan Rani (sarod), Panna Lal Ghosh (flute), Ram Ganguly (sitar), Sripada Bandyopadhyaya (sitar), Rebati Ranjan Debnath (sitar), Mrs Sheela Bharatram (sitar), Idri Singh (sitar), Jitendra Pratap Singh (sitar), Arun Bharatram (sitar), Mrs Swarnalata Chopra (sitar), Naidu (violin), Roshan (violin), Jatindra Nath Banerjee (violin), Ram Pyro (harmonium), Ghurrey Maharaj (dhrupad), Gulgul Maharaj (harmonium), Vinay Bharatram (dhrupad), Aashish Khan (sarod), Dyanesh Khan (sarod), Khurshid Khan (sitar), Shubendra Shankar (sitar), Indraneel Bhattacharya (sitar), Sanat Banerji (sarod), Monoj Shankar (sitar), Partha Bose (sitar), C. L. Das (sarod), Ranjit Banerjee (chandra sarang), Dyuti Kishore Acharya (sitar), Balai Banerjee (sitar), Bibek Ranjan Singha (sitar), Nirmal Kumar Roy Choudhury (sitar), Hiren Mukherjee (sitar), Basantrai Brahmabhatt (sarod), Pratima Roy Choudhury (sitar), Pranesh Khan (tabla), Vishwa Mohan Bhatt (Mohan veena, Indian slide guitar), Krishna Bhatt (sitar & tabla), Salil Bhatt (satvik veena), Brijbhushan Kabra (guitar), Satyadev Pawar (violin), Vinay Bharat Ram (vocalist), Vishnu Govind Jog (violin), Ameena Perera (sitar), Hariprasad Chaurasia (flute), Debasis Chakraborty (Indian slide guitar), Debi Prasad Chatterjee (sitar), Nityanand Haldipur (flute), Sudhir Phadke (sitar), Pradeep Barot (sarod), Basant Kabra (sarod), Kokila Rai (surbahar), Chandrakant Sardeshmukh (sitar), Shashwati Ghosh (sitar), Amit Hiren Roy (sitar), Daniel Bradley (sitar), Peter Van Gelder (sitar), George Harrison (sitar/guitar), Sandhya Apte (sitar), Headset Desai (sitar), Rooshikumar Pandya (sitar), Prabha Agarwal (sitar), Uma Guha (sarod), Stuti Dey (sarod), Suresh Vyas (sarod), Milind Sheorey (flute), Anupam Shobhakar (guitar/sarod), Rick Henderson (sarod), Siddhartha Banerjee, Debanjan Bhattacharjee (sarod), Aditya Verma (sarod), Ranajit Sengupta (sarod), Amelia Maciszewski (sitar), Dishari Chakraborty (santoor), Rishi Ranjan (sarod), Amitava Majumdar (sarod), Prasenjit Sengupta (sarod), Somabanti Basu (sarod), Joydeep Mukerjee (sarod), Dr Seema Ganatra (sitar), Satyam Rai (sarod), Mallar Bhattacharya (sarod), Tarun Bhattacharya (santoor), Samaresh Chawdhury (vocals), Bikram Ghosh (tabla), Kartick Kumar (sitar), Paul Livingstone (sitar), Ronu Majumdar (flute), Gaurav Mazumdar (sitar), Udai Mazumdar (tabla), Manju Mehta (sitar), Ramesh Misra (sarangi), Barunkumar Pal (Hamsa veena), Barry Phillips (cello), T. Radhakrishna (sitar), Shubendra Rao (sitar), Kartik Seshadri (sitar), Daya Shankar (shehnai), Stephen Slawek (sitar), Aditya Verma (sarod), Shiv Balak Tiwari (sitar), Som Kartik Sharma (sarod), Shyam Bihari (sarod), and so many more.